City in the county of Zemplin, Hungary. 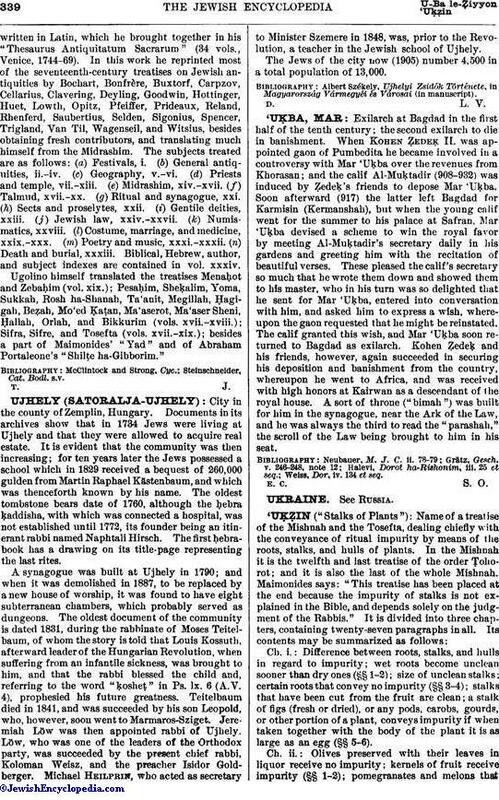 Documents in its archives show that in 1734 Jews were living at Ujhely and that they were allowed to acquire real estate. It is evident that the community was then increasing; for ten years later the Jews possessed a school which in 1829 received a bequest of 260,000 gulden from Martin Raphael Kästenbaum, and which was thenceforth known by his name. The oldest tombstone bears date of 1760, although the ḥebra ḳaddisha, with which was connected a hospital, was not established until 1772, its founder being an itinerant rabbi named Naphtali Hirsch. The first ḥebrabook has a drawing on its title-page representing the last rites. A synagogue was built at Ujhely in 1790; and when it was demolished in 1887, to be replaced by a new house of worship, it was found to have eight subterranean chambers, which probably served as dungeons. The oldest document of the community is dated 1831, during the rabbinate of Moses Teitelbaum, of whom the story is told that Louis Kossuth, afterward leader of the Hungarian Revolution, when suffering from an infantile sickness, was brought to him, and that the rabbi blessed the child and, referring to the word "ḳosheṭ" in Ps. lx. 6 (A. V. 4), prophesied his future greatness. Teitelbaum died in 1841, and was succeeded by his son Leopold, who, however, soon went to Marmaros-Sziget. Jeremiah Löw was then appointed rabbi of Ujhely. Löw, who was one of the leaders of the Orthodox party, was succeeded by the present chief rabbi, Koloman Weisz, and the preacher Isidor Goldberger. Michael Heilprin, who acted as secretary to Minister Szemere in 1848, was, prior to the Revolution, a teacher in the Jewish school of Ujhely. The Jews of the city now (1905) number 4,500 in a total population of 13,000. Albert Székely, Ujhelyi Zsidók Története, in Magyarország Vármegyéi és Városai (in manuscript).